ICanServe Foundation will hold a volunteer orientation on August 25 for those who wish to learn more about its advocacy of early breast cancer detection. 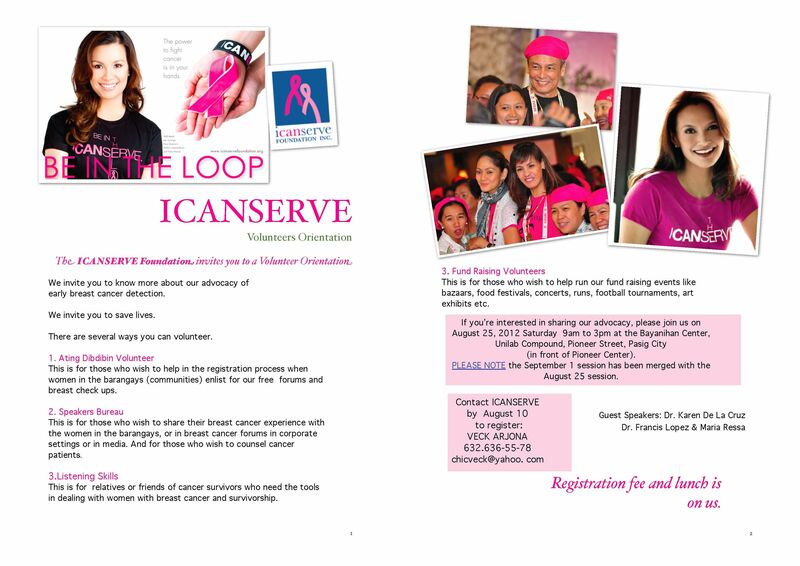 “We invite you to save lives,” says the ICanServe invitation sent to its community of breast cancer survivors and supporters. 1. Ating Dibdibin Volunteers (open to anyone) help in the registration process when women in the barangays (communities) enlist for our free forums and breast check ups. 2. Speakers Bureau (for breast cancer survivors) share their breast cancer experience with the women in the barangays, or in breast cancer forums in corporate settings or in media. They also counsel cancer patients. 3. Fund Raising Volunteers (open to anyone) help run fund raising events like bazaars, food festivals, concerts, runs, football tournaments, art exhibits, etc. Volunteers will be oriented on August 25, from 9 a.m. to 3 p.m. at the Bayanihan Center, Unilab Compound, Pioneer Street, Pasig City (in front of Pioneer Center). Confirmed to speak at the event are long-time ICanServe volunteers Dr. Karen De La Cruz and Dr. Francis Lopez, as well as a new supporter, Maria Ressa. Register through Veck Arjona, 636 5578 or chicveck@yahoo.com.